In Feng Shui, main door or entrance is given very high degree of importance and that’s because it’s the main door from where the Qi energy enters into your home. Now, I’m sure that you’re aware of the problems that very fast or extremely slow moving Qi and misbalance of 5 elements (and colors) can lead to and that’s why its extremely important that you feng shui the entrance of your home. Here, I’ve assumed that you’re aware of feng shui and concepts of Qi energy; if, by any chance, you aren’t then please read the article @ Feng Shui to understand the concepts. Furthermore, if you’re planning to feng shui your home, then our room by room feng shui guide @ Feng Shui House is surely a big help. Since a house is “the place” where we all tend to retire , relax and enjoy after strenuous day of office and work, we want the place to be comfortable, relaxing, calm, welcoming, cozy and everything positive that you can think of off the top of your head. Now, having a feng shui compliant entrance helps to usher in health, wealth, happiness, prosperity, calmness, love, trust and a lot of positivity into your home and that’s what we all want. Isn’t it? Furthermore, a feng shui compliant main door also tries to keep all sorts of negative energy away from your home thus saving you from landing into many troubles and issues. As said earlier, we don’t want very fast or slow moving Qi to enter our home; in fact, the type Qi that we all need – or rather want – to enter our houses is the moderately moving one and that’s because a really fast moving Qi brings in lot of anxiety and an extremely slow one brings lethargy. Make the entrance, welcoming, cheerful, happy and inviting; all in all, it should be very positive. Make sure that the main door is larger than other doors. Let it open inwards and clockwise. If there’s an altar that faces the living room then it’s very auspicious. The door must be 90 degrees to the ground and not leaning inwards or outwards. Use best quality materials for main door. The main door mustn’t make any noise while opening or closing. Keep the entrance well lit. Make sure that the entrance is visible; if it isn’t then place plants and lights to make it visible. Hang a beautiful name plate and keep it well lit too; this’ll help auspicious opportunities to find you easily. If there’s a crack or dampness in the main door then either get it repaired or change the door. Place three coins tied with red ribbon under the ground or rug inside the main door. A good feng shui tip is to place a photo of 100 birds near the entrance as it symbolizes 100s of opportunities flying your way. Placing fortune plants is another good feng shui trick. Placing plants next to the home’s entrance is very good feng shui; just make sure that the plants don’t block the entrance. If there’re plants near the entrance of the home then they must be thriving, well maintained and not dead. A pair of Foo Dogs helps to prevent negative energy entering your home. Placing a pair of dragon inside main door is considered auspicious. A water fountain towards right side of the door is good feng shui; this brings prosperous energy in the house. Placing statue of any friendly animal, religious figure (such as Buddha) or an angle provides stability. Put a bright and colorful welcome mat at the entrance. Keep the path that leads to your home, clutter free and clean; remove broken sprinklers, old newspapers, dead leaves and plants etc. No clutter near the entrance. Avoid sliding, circular or slanting type of doors as entrance. Avoid another house’s main door facing yours. No septic tank under the entrance. Shoes, shoe racks, garbage and dustbins near the main door are a strict no. Avoid doors that close automatically. Try to avoid main door that facing intersecting roads. Poles, trees, wires etc. directly in front of the main door are poison arrows; either avoid such houses or see poison arrow section for remedies. Avoid houses where a shadow from another building or a tree falls on the entrance. Avoid keeping the main door dull; you can have some nice carving or designs on it. No mirrors in front of entrance else all positive energy will bounce away from the house. Now, it won’t be a new thing if I tell you that colors mean a lot in feng shui; also, as with everything else there are some feng shui tips for choosing colors when it comes to main door. Here, I assume that you’re very well aware of the relationship between colors, directions and the 5 elements. If – by any chance – you aren’t then please read the article @ Feng Shui Colors, Directions & Elements to know more. Now, to make it really easy for you to understand what color to choose for your main door, I’ve created a small table (that you can see below); do have a look at it and you’ll understand feng shui colors for home entrance in a jiffy. Below table shows you how to choose the best color for the main door of your home depending upon its direction. South Red or shades of red. Apart from all this you also need to pay very special attention and need to look for any poison arrows that may be directed towards your home’s entrance. Since remedying poison arrows are a very important part of feng shui, I’ve dedicated the next section of the article to them, so just read on. Poison arrows are one of the worst things that can point to your home; they tend to alter the movement of calm and positive Qi to a fast and rapidly moving one; and that’s what we – definitely – don’t want to get into our home. And those are few – in fact – very few. But that’s certainly not the end of the world as there’re remedies that you can apply if you ever happen to live in a home that’s got poison arrows aimed at it. Now, depending upon the direction from which the poison arrow is coming towards your home, you need to apply the remedy. Again, for ease of understanding and simplicity, I’ve created a table that’ll reveal to you the remedies that you can – and must – apply in case you find a poison arrow towards your home. Alright, with all this we’ve come to the end of this article about feng shui main door of the house. I trust and believe that you’re, now, in a position to identify feng shui defects or deficiencies when it comes to house entrances and provide an equally effective remedy for the same. Do leave your thoughts in the comments section below. Be Social. Share the awesome information! Stairs or staircases (as some like to call it) aren’t a new concept when it comes to multistory home. They have been in use since ages and chances are that they aren’t going anywhere in future too! Stairs allow everyone to move from one floor to another with ease (more ease while coming down). Now, in feng shui, stairs have a bad repute, although not as bad as toilets, but bad enough to make you pay special attention towards having feng shui staircase in a home. Here it’s assumed that you’re well aware of feng shui concepts like Qi energy and its movement; if you aren’t then you can learn about feng shui @ Feng Shui. For learning complete home feng shui, head over to the room by room house feng shui guide @ Complete Feng Shui House Guide. Feng Shui Stairs – Why Are They Important? In the previous section, we stated that stairs have a bit of a bad repute in feng shui and here’s the reason why; you must know that stairs are heavy – in fact very heavy – structures; hence, they tend to exert pressure wherever they’re located, what this means is that they’ll try to suppress the benefits or positivity of the area of the house where they are located. Example #1: If, in a home, there’s a staircase in the wealth section of a house i.e. in South-East, then the financial condition of the residents of that house won’t be strong. Now, in no way does this means that the family will go bankrupt (however they may, if there are other severe defects in the house), what this means is that the family will face struggle when it comes to money. They may earn a good amount but won’t be able to save anything. They’ll face unnecessary, unexpected & unwanted expenses. Example #2: Suppose a staircase is situated in the health area of the house i.e. in East, then there will be some or the other medical issue that’ll keep troubling the residents of that house. No matter what they do, no matter how good of a doctor they consult, the issues will remain there. We hope that the above 2 very simple – but easily possible – examples will make you believe as to why you must be looking to feng shui stairs in your home; because – no matter what happens – you’ll never want yourself or your family to walk the path of difficulty and misery. 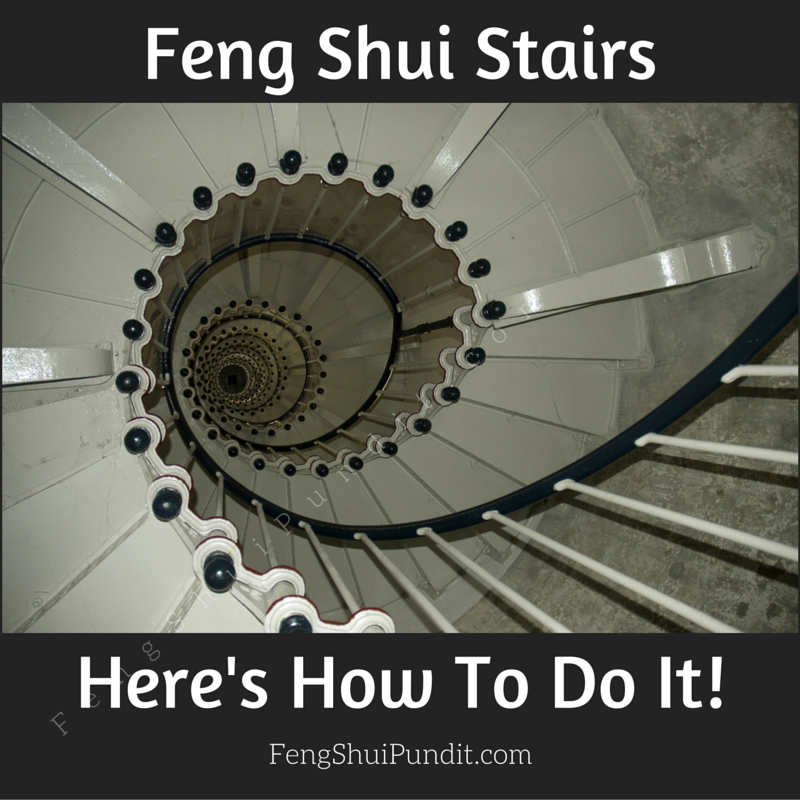 Feng Shui Stairs – How You Can Achieve It! Ok, in this section of the article we’ll deal with the actionable stuff i.e. the rules and regulations of feng shui that you need to keep in mind and apply while making staircase in your home. As said earlier, there are certain rules and regulations when it comes to feng shui staircases and below we’ve listed those rules just the way you like them – in do’s and don’ts format. So without any more delay, let’s just jump into action and learn what needs to be followed and what needs to be avoided as per feng shui for stairs. Try to keep 1, 2, 5, 10, 13, 14, 17 or 22 as the numbers of steps in a staircase. Keep the stairs well lit. Do fit uplights on landings. Make sure that the stairs are sturdy. Use shades of light and soothing colors for staircases. You can use wood, metal or concrete as materials for making stairs. It’s better to have wooden stairs in South, East and South-East of a home. If you’re making stairs in North then you can use metal. Concrete stairs can be made in North-East, South-West, West and North-West. Do remember to place a pair of Foo Dogs (Available on Amazon US, IN, CA, UK, DE, ES, FR & IT) to prevent bad or negative energy going upstairs. Make sure that the steps are comfortable; they shouldn’t be too steep or too shallow. Make the staircase wide enough for everyone to use it easily. If there’s a curved staircase, then make sure there aren’t much turns in it and try to keep the staircase clockwise. A crystal chandelier, at the start of stairs is good feng shui. No stairs at the center of a home; it’s like having something very heavy at the heart and that’s never a good feng shui. No broken stairs; if any of the landings is broken then repair it immediately. Stairs shouldn’t face any corner of the house. Never let a stair face another stair. No staircases near home’s entrance. Avoid top or bottom of stairs facing main entrance. No toilets at start or end of a staircase. No staircase in front of bedroom’s door. Never have red colored stairs; it brings misfortunes. Never make a kitchen, bedroom, dining room, bathroom/toilet and cash locker under staircase. Never place or store water under a staircase. Please avoid stairs in East, South-East and South-West of your home as they rule Health, Money and Love aspect of your life respectively. Avoid creaky or weak materials for making staircases. Avoid any spaces between landings in a staircase. The space between landings means leakages and that’s a bad feng shui. Never place mirrors on staircases. Read our article @ mirror feng shui to know more. With this we come to the end of this article; as you now have a very good knowledge of feng shui stairs, we believe that you’ll apply the tips that we’ve mentioned above and make the stairs in your home a feng shui compliant one. Furthermore, we hope and sincerely believe that you really liked the above information on feng shui stairs. Hence, we request you to please do share this information to all the people you know. Do let us know your thoughts on this article in the comments section below. In feng shui, dining rooms are given a very high degree of importance and that’s because it’s “The Room” where a family is “supposed to” dine and spend a real quality time together. However, you must understand that piling all these items – that don’t actually belong – to the dining room has a very – and very I mean – negative effect on feng shui of dining room. In fact, I can go ahead and boldly state that piling clutter in any area of a home or office is bound to deteriorate feng shui for that area because they restrict the free flow of Qi energy in the house. Note: Here, I assume that you’re aware of feng shui and Qi energy concepts; if you aren’t then please read the article @ Feng Shui & Qi Energy. Having said that, I nowhere mean that you can’t have kid’s toys or laundry clothes in the house, what I am trying to say is that just keep them at appropriate places and don’t let them clutter your house. Now, I know that you want to learn – and really understand – feng shui dining room tips, so, without any delay let’s jump right away to those. Feng Shui dining room is aimed at making the dining room in your home a feng shui compliant one. A feng shui dining room is the one that arouses hunger, brings harmony, strengthens the bond amongst family members, attracts prosperity, enhances wealth and a whole lot more. Below are feng shui dining room tips (in do’s and don’ts format). Make sure that the dining room is inviting, comfortable, hunger arousing and calm. Maintain balance of colors in dining room; don’t make it too bright or overly dull. Dining room must be well ventilated and it should receive plenty of sunlight. Hang a mirror in dining area such that it reflects the dining table; this’ll bring in more prosperity. Follow feng shui mirror guidelines mentioned @ Feng Shui Mirror Placement while placing mirrors anywhere in your home. You can provide a wash basin in North or East of dining area. Keep the dining room as near as possible to kitchen. Have kitchen and dining on the same floor. If your kitchen is really huge then utilize an area of the kitchen as dining area. If the dining room in your home is a part of living room (a common case nowadays) then put curtains or potted plants as a line of demarcation. Go for a square/rectangular or oval/circular dining table. Make sure that the dining table is of high quality wood. The dining table must be big enough to provide space for everyone. Keep the number of chairs even. Keep sitting arrangement such that no one’s back is towards a door or window as it causes a sense of insecurity. East facing is good for head of the family; other members can face North, East or West while dining. Be polite and gentle to family member while dining (this, in no way, means that you can yell at them elsewhere); be gentle and polite always. Be relaxed, calm, happy and stress-free while dining; in fact be this way always. Always keep something on the dining table; you can keep fruits on it; apples help develop friendship, pears are good to attract positive energy, peaches aid in good health and oranges symbolize richness and prosperity. If fruits aren’t your choice then you can keep flowers on dining table. Just make sure not to use dried flowers, they imply deterioration. Make sure to have meals with your family daily; however, if that’s not possible then at least have a meal together once a week. Images of mouthwatering and lip smacking dishes in dining room arouses hunger. Always thank God before you start eating. No toilet doors in front of dining table or dining room. Make sure that dining room door and house entrance doesn’t face each other. Make sure that the dining room doesn’t become a room of dining etiquette for anyone; else they’ll lose interest in eating. Never sit under a beam while eating. Please avoid TV and other electrical instruments in the dining room; this’ll make the family to spend some quality time together. Avoid low ceiling in dining room. Avoid negative paintings such as weeping girl, war, crime etc. in dining room; in fact avoid them everywhere. Avoid hanging clocks in dining room; they tend to create haste while eating. Avoid eating alone; that increases loneliness. Put on some soothing music if you’re alone. Avoid irregular shaped dining tables such as, diamond or hexagonal shaped ones. Avoid glass top dining tables as they’ll bring in nervous energy. Avoid dining tables that have cushions on top; go for hard top dining tables as they represent solid foundation. Never place the dining table touching a wall; it must be away from any wall so that everyone can sit comfortably. Avoid rocking chairs in dining room. Avoid facing south while eating. Don’t allow kids to sit in the South-West corner of dining table. Never use or even keep broken or chipped utensils or glass wares. Your reading this far, makes me – really believe – that you’ve liked the information above; do share it with your friends and family!!! “Bathrooms and toilets have got a really bad reputation as far as feng shui is concerned”. 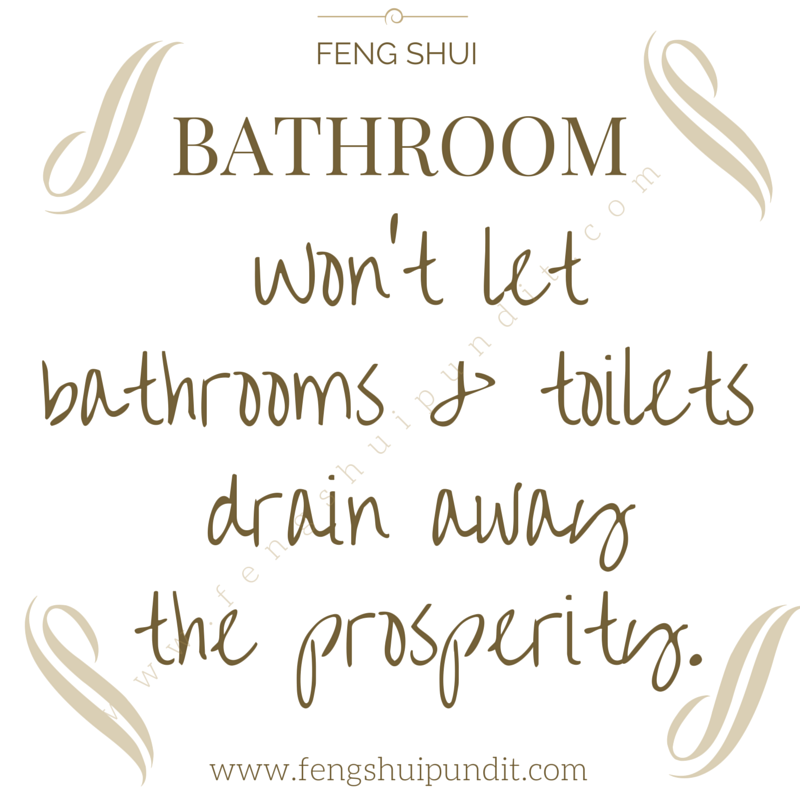 and here’s why: As per feng shui, bathrooms and toilets (I’ll call them bathrooms from hereon for sake of simplicity) have the tendency to drain or flush away the positive “Qi” energy of your home. Hence, if “Qi” enters the bathroom (read as bathroom or toilet) then rest assured that it’s flushed right away out of your house and that’s what we certainly don’t want to happen. Note: Here, I assume that you’re completely aware of concepts of feng shui and “Qi” energy; if – by any chance – you aren’t then please read the article @ Feng Shui and the concept of “Qi”. Ok, coming back to the topic of bathrooms; since each and every part or corner of a house is related to an aspect of life, hence a bathroom in one particular corner or part would affect that specific area of life; this is what I’ve explained further – with examples – in the next section of the article, so, just read on. As said earlier that each and every part or direction of a home is related to a specific aspect of life and a bathroom in that part will drain the luck or benefits of that aspect of life. A bathroom in South-East: – Since South-East part of a house is related to wealth, a bathroom in this part will drain away all the money from the house; joblessness, sinking income, increasing debt and even bankruptcy are some effects of South-East bathroom. In North-West: – The North-West part of the house deals with helpful people and luck from heaven, a toilet in this part will drain away all those from you. No help from anyone, backstabbing, office politics, discredit etc. are some effects of North-West bathroom. and the list can go on and on for other directions too. Now, there’s an image in the article @ Colors and Directions that’ll reveal to you the relation between directions and the aspect of life ruled by each direction. You can have a look at that image and you’ll be able to understand the good aspect – of your life – which a bathroom in that particular direction will drain away. But hey, a bathroom or toilet have to be somewhere in the house. Isn’t it? The answer to that it yes, they can be in the house but remember wherever they are they’ll – at least try to – reduce the benefits of that direction(s). Hence, it’s vital to have feng shui a bathroom in the home; this’ll minimize – or possibly eliminate – the draining or flushing of “good” from life; so, the next question popping in your mind would be how to have a feng shui bathroom? That’s exactly what I’ve detailed – in do’s and don’ts format (I know you love it) – you in the next section of this article, so just read on. So, here we are, in the second section of the article; the section that deals with the actionable things when it comes to bathroom feng shui. Here in this section you’ll find feng shui bathroom tips – as promised, in do’s and don’ts format – all you now need to do is to just go through these tips and apply them to the bathroom and toilets of your home so that they aren’t able to drain luck, money, love or anything positive from your home. Here, I’ll suggest you, that before you start reading feng shui bathroom tips, you must read the article @ Feng Shui Colors; that’s because once you read – and really understand – the essence of that article, you’ll be able to understand the reasons for – most of – the remedies that are mentioned below. However, if you don’t read that article, that’s completely ok, the remedies will still work; but in that case you’ll just be applying the remedies without knowing the exact science or reason behind the remedies. Anyways, it’s all up to you. So, without any more delay, let’s raise the curtain and start learning feng shui bathroom tips. The tips 1st to 8th are general bathroom tips (which can be applied to any bathroom or toilet); number 9th to 13th are direction specific feng shui bathroom tips i.e. you must apply them if your bathroom is located in that particular direction. Make sure to keep the toilet lid closed. Replace any torn curtains with new ones. Keep the bathroom clean, fresh and airy. Use a good air freshener. Make sure that the bathroom receives ample sunlight and fresh air. Keep windows, ventilators and doors of bathroom clean. Place a mirror on the door of the bathroom, this’ll make the “Qi” bounce back into the house/room and not enter the bathroom or toilet. Just make sure that the mirror is placed as per rules of feng shui; more on feng shui mirror rules @ Mirrors and Feng Shui. Get the best essential aromatic oils for a relaxed bath. Hang a metallic wind chime in the bathroom. Make sure that there are no Chinese symbols on the chime. Make sure that no one passes or sits under the wind chime. Place metallic colored rugs such as gold, silver or grey; circular shaped ones must be preferred. Hang a crystal ball in the window of the bathroom; the rainbow lights from the crystal will reduce the bad fire energy. Make sure to cleanse the crystal ball as it’s going to absorb negative energy. Alternatively, you can also use a crystal geode which is a rock with hollow center. Place square shaped skin colored rug; you can also opt for yellow, pink or chocolate brown colored ones. Place some lush green houseplants in the bathroom. Put a square shaped rug in shades of green. Place glitter lamps in the bathroom and make sure to turn them on for around 2-3 hours daily. If glitter lamps aren’t your thing then you can light candles in the bathroom. Triangular rugs in shades of red are best for such a bathroom. Just place an urn with water in the bathroom. Place blue shaded rug; if possible, get a wavy shaped one. Avoid clutter in the bathroom; in fact avoid it everywhere. Avoid mirrors reflecting toilet seats. More on mirrors feng shui @ Feng Shui Mirrors. Avoid leaking taps and faucets; replace them immediately else they’ll flush away the money. Replace broken items, such as, soap dispensers, shampoo bottles etc. Don’t keep old and worn-out toothbrushes in bathroom. Avoid a bathroom or toilet at the center of home. Avoid bathroom door facing bedroom, kitchen or dining room. Avoid locating a bathroom adjacent or near to house entrance. Never have a bathroom above kitchen or main door. Never place metallic wind chimes in North, North-West or West bathroom. Never try to place metallic things in the South-East bathroom; it’ll drain away all the money from house. With this we come to the end of this article about feng shui bathroom tips. I am sure that you’ll be benefited by all the above mentioned tips – obviously after applying them – in the bathrooms and toilets of your home. If you found this article to be helpful, then please share it with everyone you know. A feng shui kitchen is vital for each and every home and that’s because a kitchen has got lot of fire energy associated with it. Now, it’s not a rocket science to know that only controlled fire is beneficial; an uncontrolled fire destroys anything and everything in its way; this even holds true for the “fire element” that kitchen has plenty of. This is one of the simplest – yes extremely important – reason to have a feng shui kitchen in a home. Feng Shui Kitchen – What Is It? To make you understand – in simple way – the meaning of feng shui kitchen, I want you to consider the words “feng shui” and “kitchen” separately and then I’ll combine both the terms. Feng Shui: – It’s an ancient Chinese science of creating happiness and abundance by altering or modifying the movement of chi energy and by balancing the effect of elements and directions. You can read more about it @ Feng Shui. However, as per now, just understand that it’s the science that creates positivity and suppresses – or even destroys – negativity. Kitchen: Kitchen is the place where healthy, nutritious and yummy food is cooked; the same food – once consumed – gives you and your family the energy and stamina for day-to-day chores. Furthermore, as said earlier, a kitchen has a lot of fire element involved and it’s always better to keep the “fire element” under control; this is why you must make it feng shui compliant. Now, combine the two terms, i.e. “feng shui” and “kitchen”; what you’ll get is a feng shui kitchen; a kitchen that can – and has – all the ability in the world to ward off any – or all – negativity while, simultaneously, enhancing positive energy in your home. The same positive energy then spreads into your home making you and your family happier, healthier and optimistic and everything good that you can think of. 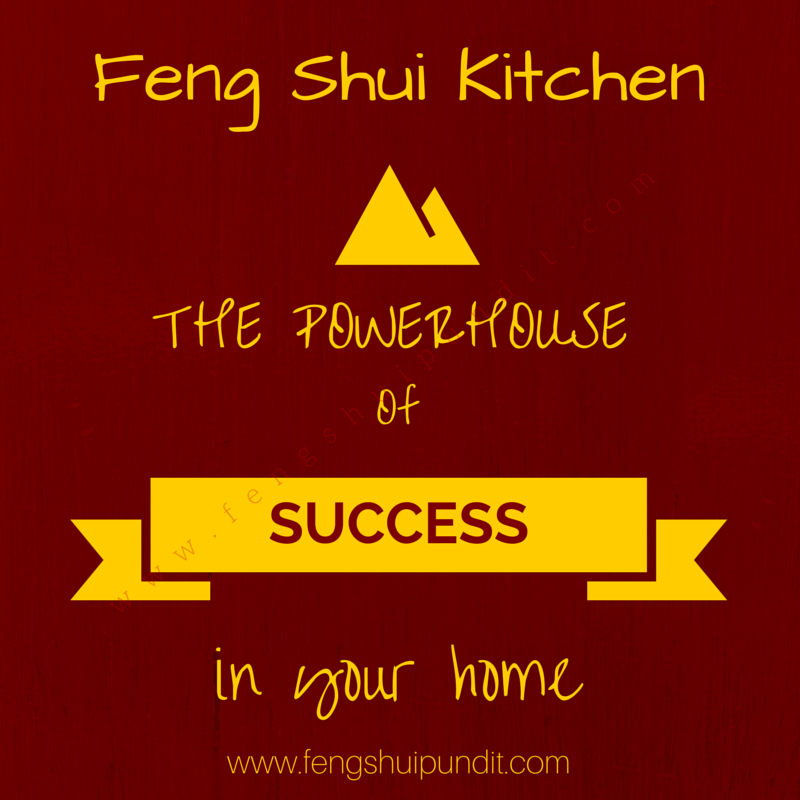 Hence, it’s important – and important I mean – to always have feng shui kitchen in your home. Achieving a feng shui kitchen isn’t a herculean task; all you need to do is to read, understand and apply below mentioned kitchen tips (in dos and don’ts format) and you’re done in a jiffy. So without any delay, let’s start learning kitchen tips. Try to place the kitchen towards back door of the home. Keep the kitchen clean and uncluttered at all times. Keep the kitchen well lit and ventilated. Face east while cooking in kitchen. You can have windows in East or West walls of kitchen. Make sure to keep light weight things in East and North of kitchen. You can have a sink in North or North-East of kitchen. Keep the gas stove/burner a few inches away from wall. Keep at least 1-2 feet distance between stove/burner and kitchen sink. If there’s no option then place small plants (Available on Amazon US, IN, CA, UK, DE, ES, FR & IT), pot of herbs or something in green color between stove and sink. You can also place a green color decorative glass panel between stove and sink. Point 9 applies for refrigerators too; you must keep 1-2 feet distance between stove and refrigerator in kitchen. Repair all leaking taps and faucets in kitchen (or anywhere in your home) else that’ll drain away all money and wealth from the house. You can place a dining table in North-West or West of kitchen (if your kitchen is huge). Avoid placing kitchen near front door of home. Avoid a kitchen at center of home. Never have a kitchen under a toilet. More on toilets @ feng shui toilet. Avoid kitchen directly under a bedroom. More about bedroom @ feng shui bedroom. Avoid keeping soiled utensils and platform overnight. Never have a kitchen in North-West of home; if there’s no option then paint the kitchen in blue or black color or change the floor tiles to black color. Never place the stove directly in front of kitchen’s entrance door. Never ever in any case keep gas stove/burner in North-West of kitchen. Avoid kitchen door facing a bedroom, toilet or main door of your home; if there’s no option then place a partition or a sort of screen such that the stove isn’t visible from other doors. Always avoid keeping gas stove under a beam; if there’s no option then make a false ceiling to solve this defect. Another – simpler and cost effective – remedy is to place or hang images of clouds, flying birds or a rising hot air balloon on the beam. Make sure not to place kitchen’s entrance in any corners. Never face west while cooking in kitchen; this may – and in many cases has – lead to severe health problems to the cook. If the cook faces south while cooking then the family faces monetary losses. These were all the general guidelines that you must follow to have a feng shui compliant kitchen in your home. Furthermore, in my article that discusses the relationship between colors and feng shui @ feng shui colors, you’ll get direction wise defects and their remedies about kitchen; hence it’s a MUST READ article after you’ve finished reading this one. As said earlier, all you – now – need to do is to apply above mentioned kitchen tips and I’m sure that you’ll feel and appreciate all the positive changes that’ll happen in your life. 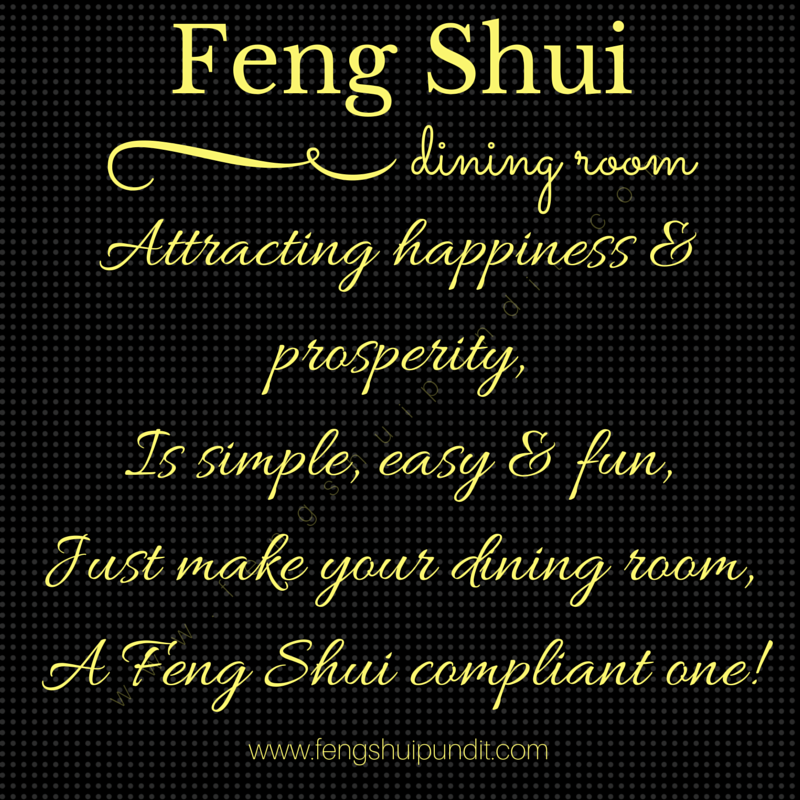 And yes, once the food is cooked, it’s usually consumed in the dining room or dining area of the home; hence another must read article for you is about dining room @ feng shui dining room. If you liked the above information on feng shui kitchen then please share the same with others too. Feng Shui House – How to Achieve One RIGHT NOW! 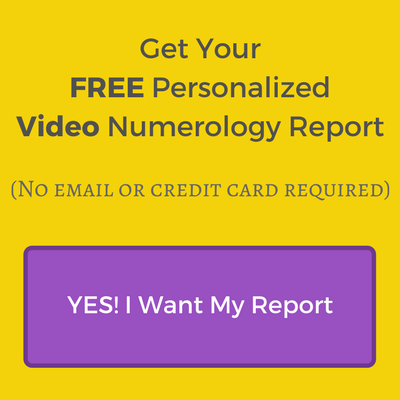 Feng Shui Bathroom – Stop Flushing Prosperity! 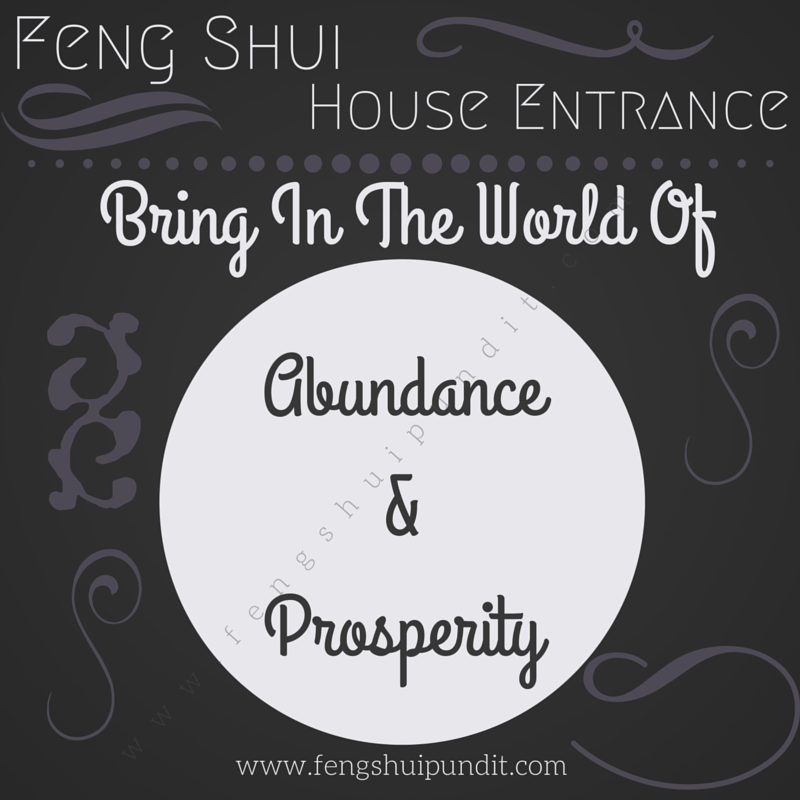 Feng Shui Home Entrance – Here’s How To Do It!